Dairy foods have always been known to provide a lot of calcium to both the body in general, and the teeth in specific. 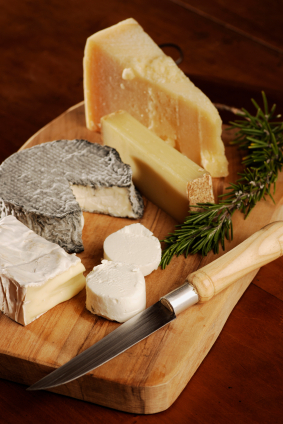 Cheese also has ingredients in it that help to keep the teeth cleaner than most other foods you eat. The cheese leaves your teeth better for having eaten it than not, even if you are not able to brush immediately after. It sticks to your teeth, protecting it from acid erosion, plus it neutralizes the acids in the foods you eat and increases saliva production in your mouth. These are all great reasons to eat a lot more cheese! Try making new sandwiches for lunch one or two days per week. Figure out a type of bread that sounds good, a meat (or meat substitute) that sounds good, and give a new type of cheese a try. Some cheeses you may like, while others may not suit your fancy, so keep track of what you do like and use those cheeses more often. You can also try making old favorites with a new type of cheese to see if you like how it tastes. Consider a grilled cheese with a baby swiss, homemade mac and cheese with a creamy brie, or a salad with a bit of fresh gruyere in the mix. Each cheese brings its own flavors to the party, so experiment until you find some that you really enjoy! Make sure that you keep up with your proper home care while trying these new cheeses. While they can help protect your teeth in the event you cannot brush, that doesn't mean you shouldn't when you can. Cheese can help keep your teeth strong, but it will do a lot more good when paired with dental visits, brushing, and flossing regularly. Please contact us if you have any questions about cheeses effect on your oral health.